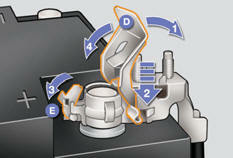 Procedure for starting the engine using another battery or charging a discharged battery. 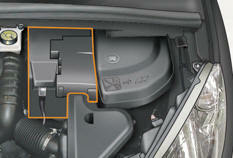 The presence of this label, in particular with the Stop & Start system, indicates the use of a 12 V leadacid battery with special technology and specification; the involvement of a PEUGEOT dealer or a qualified workshop is essential when replacing or disconnecting the battery. Start system will only be active after a continuous period of immobilisation of the vehicle, a period which depends on the climatic conditions and the state of charge of the battery (up to about 8 hours). The battery is located under the bonnet. remove the plastic cover on the (+) terminal. Immobilise the vehicle: apply the parking brake, put the gearbox into neutral (or position P if your vehicle has an automatic gearbox), then switch of the ignition. Check that all electrical systems are off. Do not reverse the polarity and use only a 12 V charger. Do not disconnect the terminals while the engine is running. Do not charge the batteries without disconnecting the terminals first. Ensure that the battery posts and terminals are clean. If covered in sulphate (white or green deposits), remove and clean them. The batteries contain harmful substances such as sulphuric acid and lead. They must be disposed of in accordance with regulations and must not, in any circumstances, be discarded with household waste. Take used remote control batteries and vehicle batteries to a special collection point. When your vehicle's battery is discharged, the engine can be started using a slave battery (external or on another vehicle) and jump leads. First check that the slave battery has a nominal voltage of 12 V and a capacity at least equal to that of the discharged battery. Do not try to start the engine by connecting a battery charger. Do not disconnect the (+) terminal when the engine is running. Connect the red cable to the positive terminal (+) of the fl at battery A , then to the positive terminal (+) of the slave battery B .
Connect one end of the green or black cable to the negative terminal (-) of the slave battery B (or earth point on the other vehicle). Connect the other end of the green or black cable to the earth point C on the broken down vehicle (or on the engine mounting). Start the vehicle with the good battery and leave it running for a few minutes. Operate the starter on the broken down vehicle and let the engine run If the engine does not start straight away, switch off the ignition and wait a few moments before trying again. Wait until the engine returns to idle then disconnect the cables in the reverse order. Raise the locking tab D fully to release the cable terminal E .
Position the open clip E of the cable on the positive post (+) of the battery. Press vertically on the clip E to position it correctly on the battery. Lock the clip by spreading the positioning lug and then lowering the tab D .
Do not apply excessive force on the tab as locking will not be possible if the clip is not positioned correctly; start the procedure again. The Stop & Start battery does not have to be disconnected for charging. When your vehicle's battery is discharged or when the vehicle is to be out of use for a prolonged period, you can charge the battery using a battery charger. Contact a PEUGEOT dealer or a qualified workshop for the specification of chargers compatible with your battery. Check that the doors and boot are closed but not locked. Switch off the ignition and wait for at least four minutes. 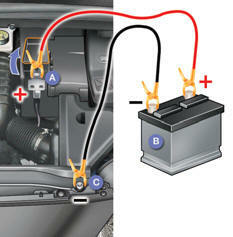 If the vehicle is to not going to be used for more than a month, it is recommended that the battery be disconnected. Follow the instructions for use provided by the manufacturer of the charger. Connect the charger's red cable to the (+) terminal of the battery, then the black cable to the (-) terminal. Once the battery is fully charged, disconnect the charger cables in reverse order. Charging should be carried out in a well-ventilated area and away from naked flames and sources of sparks, so as to avoid any risk of explosion and fire. Do not try to charge a frozen battery; first thaw it out so as to avoid the risk of explosion. If the battery had frozen, before charging, have it checked by a PEUGEOT dealer or qualified workshop who will ensure that the internal components have not been damaged and that the casing is not cracked, which would cause a leak of toxic and corrosive acid. After any reconnection of the battery, switch on the ignition and wait at least one minute before starting, to allow time for the initialisation of the electronic systems. - audio and navigation system settings. Check that no alert message or warning lamp comes on after switching on the ignition. However, if minor problems persist after carrying out these operations, contact a PEUGEOT dealer or a qualified workshop.